This is the first of 14 films that I was “forced” to watch by my fellow bloggers who participated in my Blogiversary Contest last month. This movie was chosen by Tony. Tnx for the suggestion. Let’s see what I thought of it…. Brief Synopsis – A singer turned actress must deal with a stalker when reality and fantasy seem to become merged together. My Take on it – The synopsis of this film seemed like an intriguing one but it quite quickly looses it’s draw when things get a bit too crazy early on. Instead of this being a great psychological thriller, it feels too much like a story that relies too heavily on existentialist views of life and psychobabble instead of giving us a clear cut and enjoyable storyline. I’ve never been the biggest fan of anime films and despite the fact that there are scenes where it looks quite good visually, the crazy storyline drags things down too much. In many ways, this film actually reminded me of Black Swan (2010) and also has way too many similarities between the two to be a mere coincidence. They try too hard here to try and make this film feel realistic instead of using the animation as a boost to keep things otherworldly. Unfortunately, it just doesn’t work as well as a story like this could if in the right hands. Bottom Line – Not really my kind of film. It reminded me too much of psychological thrillers which rely too heavily on psychobabble and existential plot points instead of a good clear storyline. The animation is quite good here but they try too hard to make this film seem realistic with its themes and dialogue that I can’t truly say that it worked well enough on a whole. The ending is the only thing I did not like about this movie but I loved everything else about it. Don’t recall hearing psychobabble when I watched it but it has been a few years. This is an all-time anime great. I remember seeing this in a specialty cinema. I loved it, but anime buddy fell asleep. So… this is a really divisive entry. 😉 Anime tends to be a but more philosophical (um, when it’s not Pokemon or Dragonball or something hehehe). While the exposition or idealogical meanderings may grate some viewers, at least it explores what it means to be alive; which, in certain subject matters is oddly illuminating. 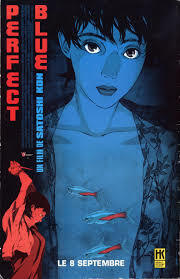 For me, Perfect Blue felt like a Hitchcock movie. It was exciting and unusual. And you’re right, I bet, Aronofsky was inspired by this! Shame you didn’t find this to your liking, for me personally, I found it to be one of the most engaging psychological thrillers I’ve seen and a brilliant exploration of the divide between public and private life (https://coogsreviews.wordpress.com/2017/03/27/perfect-blue-review/). You’re not wrong about the similarities to Black Swan though, Darren Aronofsky’s films have been heavily influenced by this film, so much so that he bought the rights to remake the film so he could recreate a scene from it in Requiem For A Dream.